This blog came about because I’m going to be testing out some recipes for my own wedding, this August, and I figured, why not post some of those here, for other people to benefit from, as well? I’m trying out a variety of techniques, to see how foods stand up to various indignities, such as being frozen, refrigerated, and left out at room temperature for a while. I don’t have all the results yet, but I’ll be checking back in on my frozen foods in a few weeks, and I’ll update then. 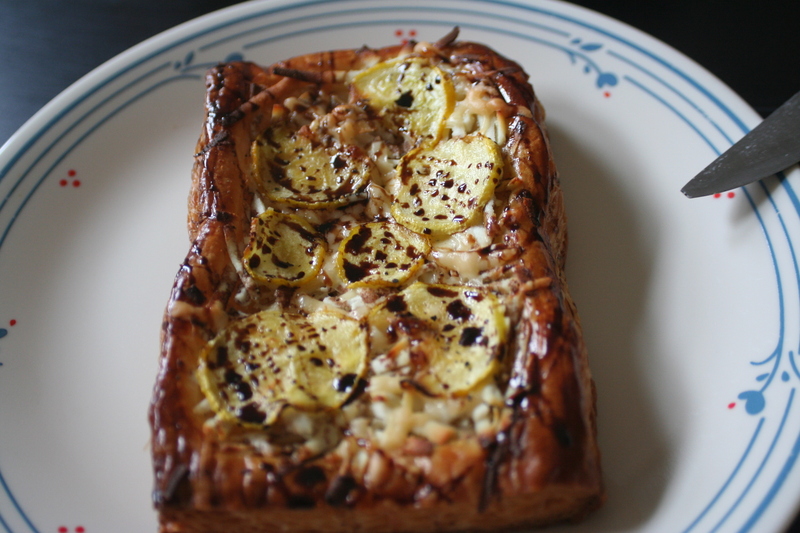 First up are ricotta and summer squash tarts. These are really good. Like really, really good. First of all, take out some pastry dough. Cut it into rectangles, and score the edges. Slice some squash really thin, and toss it with olive oil. 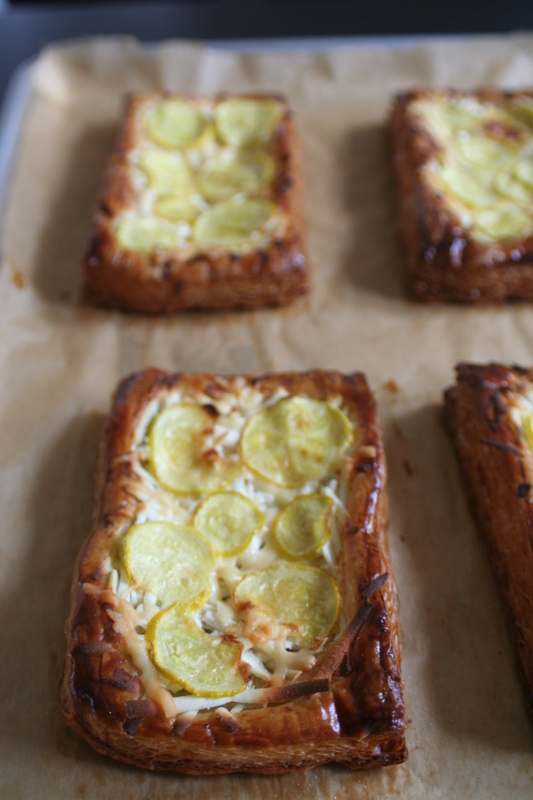 Paint your rectangles with some beaten egg, and then layer some ricotta salata on top. Ricotta salata is ricotta’s harder cousin: ricotta that’s been pressed, salted, and dried. It still has the flavor and some of the texture, but it doesn’t sog down the pastry, and it will melt, making it less likely to fall off of your tart. Then you’ll cover that with your sliced squash (I found that it cooks down really thin, so double the layer that you see in the photo). And some parmesan. 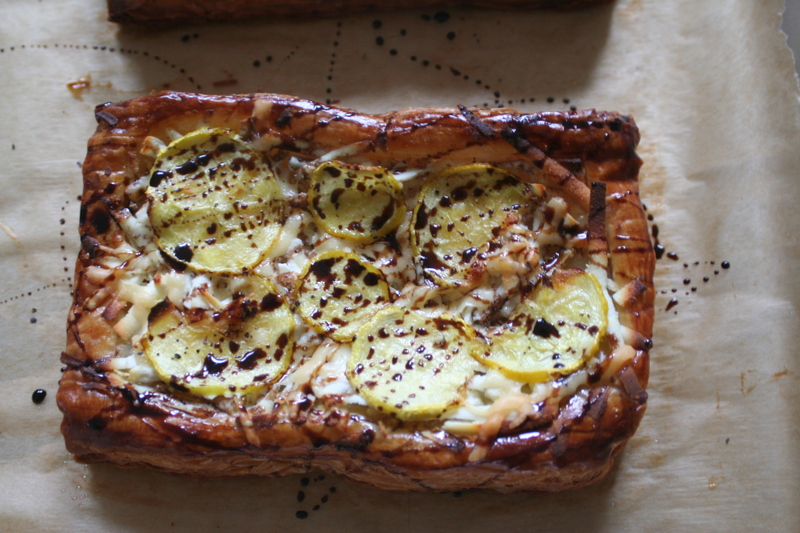 Bake it, and cover it with a balsamic sauce. And then eat some of them, because they’re delicious. Timing: The prep for six tarts took me about 30 minutes. The balsamic reduction took me 15 minutes, and the baking itself took 25 minutes, plus ten minutes to cool. Remember to give yourself some time to store them, pour on the balsamic, and pretty them up. – Sitting: After sitting on the counter for a couple of hours, these were still crunchy and great. – Chilling: After being in the fridge overnight, the tarts were noticeably less crunchy, but still good. Being brought back to room temperature helped them a lot in terms of taste and texture, although they still weren’t as good as they had been. Presentation: If you’re serving these at a wedding, throw on some nasturtium flowers, and serve the balsamic reduction on the side in a cute little jar (or, more realistically, several cute little jars). They’re good warm, and they’re good room temperature. Preheat your oven to 425 degrees. Prepare two baking sheets by covering them with parchment paper. Roll out pastry dough. One pound should make about 6-8 tarts, depending on how big you make them. Mine were about 3×5 inches. 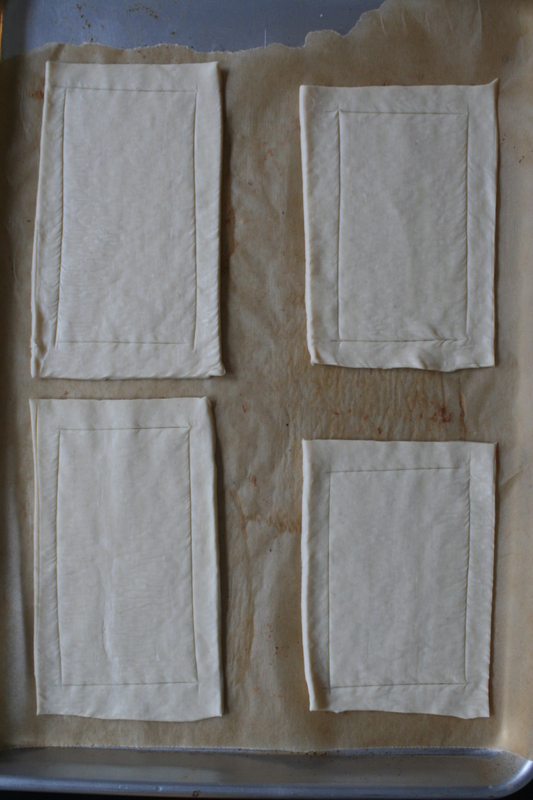 Score the dough, making a border about ½ inch from the edges. Arrange your rectangles so that they’re about 1 inch apart on your baking sheets. 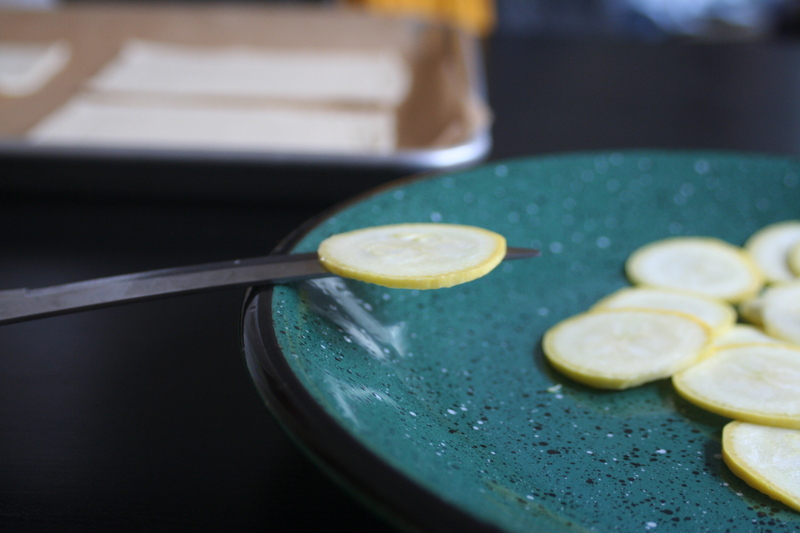 Get a nice sharp knife, because you want to slice your summer squash very thinly (about 1/8 of an inch). Toss it with a drizzle of olive oil (probably three tablespoons, but use more if you need to so that all the squash slices are well-covered). Brush each rectangle with a coating of beaten egg. Layer the grated ricotta salata onto the dough, all the way to the border. 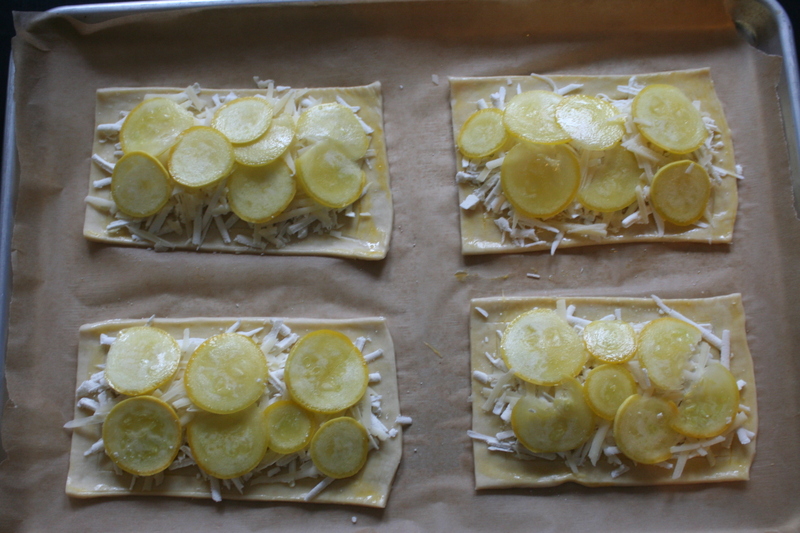 Cover the cheese with a double layer of sliced squash. Sprinkle with parmesan and ground pepper.